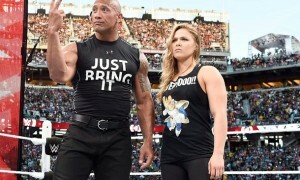 The Rock is supposed to be returning to WWE television within weeks to start this build-up and I am hoping they can make this “dream match” seem magical yet again. It has lost some steam since The Rock isn’t around much and John Cena appears to be stagnant in his current booking but they are two of the best in building a feud today & I believe they will deliver come closer to WrestleMania. Don’t you worry, this is still going to be a fun matchup to see take place on the WrestleMania stage. I originally thought (as did many of you) that Daniel Bryan would be in the World Heavyweight Championship match at WrestleMania 28. That all changed at TLC when he cashed in and won the World Heavyweight Championship. Now it appears at this present time that he will be nothing more then a transition champion (like CM Punk’s 1st World Title reign) for whoever will capture the belt before ‘Mania and I believe that person will be Wade Barrett via the Elimination Chamber. Randy Orton will win the Royal Rumble despite his injury. He is going to get that massive Royal Rumble “surprise I’m not injured anymore” pop like John Cena did in 2008 & Edge did in 2009. It’s in Orton’s hometown and he’s winning the Rumble. The Barrett/Orton feud has been one of the best feuds in the WWE right now and it should carry onto WrestleMania & shortly thereafter. 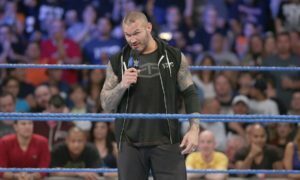 Barrett “injured” Orton and Orton will be looking for his revenge & deserve the WrestleMania spotlight to do it for being such a great WWE employee the past year. Barrett wins World Title in the Chamber, Orton wins Rumble and you have your World Heavyweight Championship match at WM 28. The worst kept secret in the WWE is no more as Chris Jericho has returned to the WWE and is looking to get back on top of the wrestling landscape yet again. Its perfect timing for Jericho as a feud between he & Punk is money in the making and something that will make the “internet” fans very happy that these two will be showcasing their skills on the greatest of stages at WrestleMania. I personally cannot wait to see this feud build because Punk feuding with Jericho is what he needs to climb even higher levels in the wrestling world. This matchup appears to be building even more in recent weeks as Triple H mentioned “ending the streak since Undertaker hasn’t been seen since” at the Slammy Awards. Obviously “the deadman” isn’t going to take that lying down (no pun intended) and should be back soon to build up to another great WrestleMania matchup. They are the veterans of the WWE and deliver on the big stage, just like Punk/Jericho I am interested to see how this matchup builds towards Miami. As for the “special guest referee” twist I have added to this match it clearly is a proponent to two things. Lesnar is coming back to the WWE and I believe he will be at WrestleMania this year but not in a wrestling capacity. 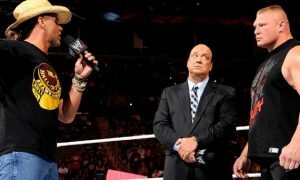 His involvement could lead to a Triple H feud heading to Summerslam and then followed up to a feud with The Undertaker at WrestleMania 29, something we thought was actually going to happen when they had their “YouTube video moment” back in October 2010. Lesnar, even in a special guest referee capacity, will also make this match feel like it’s paralleled to Cena/Rock. I still believe this match is going to happen at WrestleMania 28. Call me crazy but I actually think given a proper build this is something fans would like to see on an undercard of a WrestleMania. These two guys have worked really hard in 2011 and deserve to have a spotlight at a WrestleMania. They have come a long way since opening up WrestleMania 26 in a tag team match. The word on the street is that the Money in the Bank ladder match is returning to WrestleMania this year and that makes me very happy as it has been a really good staple for the event since its debut at WrestleMania 21. It gives you that “special attraction” feeling to the show and a good amount of wrestlers that you don’t know could actually win the match. The WWE always gives you a favorite leading into it but time and time again they always swerve us a bit to give us a winner we didn’t expect. These eight wrestlers to me are some of the most deserving to be featured in this time of matchup in Miami with anyone of them potentially winning the match but my early favorites would be either Dolph Ziggler or Sheamus. It’s been rumored to be happening at Royal Rumble or it could happen at the Elimination Chamber. Either ways the WWE is building towards something between these two brothers and why not do it at WrestleMania? I’ve added my own “fantasy booking” stipulation into this one as Dusty Rhodes should be the “special guest referee” and that if Goldust loses he retires. What a better way to put Cody Rhodes over even more but retiring his own brother for good? Rhodes is going to have a huge year in 2012 and this is just the start for an even breakout year. I simply feel this match is going to happen because the WWE has this feeling like they need to break the all-time “masks being worn at the same time” Guinness world record. I don’t know why the WWE feels obligated to break the record but it’s been talked about since the spring of last year and that it would involve Sin Cara & Rey Mysterio. That clearly won’t happen now since Sin Cara is out without injury and Rey is due back from his before WrestleMania. The reason why I have thrown Kane into this match is because he has returned wearing of all things…his mask and it was rumored that one of the reasons why they brought he back with his mask was for this reason. Weird concepts but hey you get that from time-to-time with the WWE. 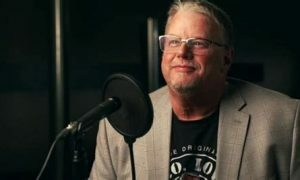 For more on this topic join us for the Thursday January 12th edition of “The Still Real to Us Show” and download the show at www.wheelhouseradio.com or www.wrestlechat.net.